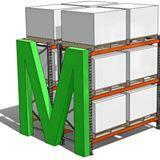 MACRACK are specialists in manufacturing various storage systems to suit your specific needs. Depending on your product you may require something different, and that is why MACRACK offer a variety of other items to suit your needs. If you would like some help deciding on which product to use or want some advice on how to store a specific product, give us a call and we would be glad to help you out.